﻿ Green and sustainable water treatment for domestic appliances. In households limescale is visible were heat plays a role. Were water evaporates limescale stays and settles. These incrustations are troublesome in washing machine, dish washer and the kettle. Deposits due to limescale are not only a matter of aesthetics but also reduce the performance of the heat transfer in these appliances. More energy is needed which can be costly. Apart from that it shortens the life time of every single appliance. Treating your water with a Merus Ring doesn’t make it softer. This means that the amount of limescale is not reduced. But deposits and incrustations are solved in the water and flushed out. Therefore they don’t harm the system anymore. 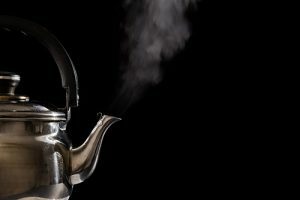 Electric kettles are used to boil water fast and safely. One disadvantage is that limescale settles fast and visible. Just as in small coffee makers unusually intense heat meets small amounts of water. These extremes are the reason why there will always be some deposits in the appliances. Both cases can be seen as hardship cases concerning anti-scaling protection. The rules are easy and can not be changed: where water evaporates minerals are left behind. Deposits where the heat should be transferred reduce the efficiency of the kettle as it works as a thermic isolation. So what can a Merus Ring do for my kettle or coffee machine? When a Merus Ring is installed in the house less limescale will settle in the domestic appliances where water is heated up fast. Additionally the limescale which is left behind has a soft texture. Therefore it can be removed with a damp cloth easily. Annoying and expensive decalcifying is not necessary anymore. What we recommend for the best result. Cold water is very important to reduce limescale. It contains less minerals than hot or warm water, therefore less minerals can settle. One advice is to give some cold water in the kettle after using it. Thus existing deposits can be solved in the water treated by Merus. If limescale gets visible please just wipe it out. This should be very easy. We also recommend to pull out the power plug when the kettle is not in use or remove the kettle from the base plate. This way the kettle and the water in it is not in contact with electricity. This could reduce the effect in the kettle.